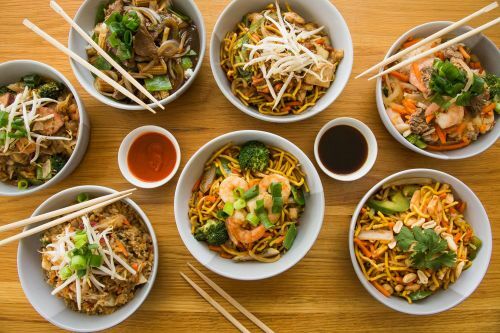 Menulog delivers for Wok Me - Canberra DFO so you'll be able to track your courier on a map. Wok me's famous garlic, ginger and oyster sauce with either chicken breast fillets, lean beef or BBQ pork and onion, carrot, capsicum, broccoli, baby corn with thick hokkien noodles. Special soy sauce with fresh basil and chilli, either chicken breast fillets, lean beef or BBQ pork and onion, carrot, bok choy, broccoli, baby corn with thick hokkien noodles. Sweet chilli sauce with either chicken breast fillets, lean beef or BBQ pork and onion, carrot, capsicum, broccoli, baby corn with thick hokkien noodles. Special oyster, ginger and spicy garlic sauce, traditional wok tossed seasonal vegetables and tofu with thin egg noodles. Soy sauce, stir fried mixed onion, carrot, broccoli, bok choy, baby corn, mushroom, beansprouts and tofu with thin egg noodles. Thin egg noodles, BBQ pork, beef, chicken breast fillets, king prawns and vegetables cooked together in a wonderful oyster sauce. Wok me’s famous malaysian sauce, king prawns, squid, shrimp, crab meat and onions, carrots, brocolico, bok choy, baby corns with thick hokkien noodles. Hot and spicy chilli sauce king prawns, squid, shrimp, crab meat and onion, carrot, brocolico, bok choy, baby corn with thick hokkien noodles. Sizzling garlic prawns with seasonal wok tossed vegetables including onion, carrot, broccoli, bok choy, baby corn with thick hokkien noodles. Special soy sauce, BBQ pork, shrimp, egg, onion, beansprouts, shallots and Asian greens with flat rice noodles and a hint of chilli. Mild curry sauce, BBQ pork, egg, shrimp, onions, beansprouts, and shallots with vermiclli noodles. Authentic pad thai noodles falmed cooked with chicken breast fillets, shrimp, egg, onion, peanuts crisp onion and coriander with our succulent home made pad Thai sauce.